Rightmove, Britain's largest online estate agency is reporting that UK home sellers have cut their asking prices for the first time this year, by dropping them by 1.6% this month. The BBC further estimated that this still leaves national seller asking prices over valued by 16% at £236,597 against the average actual sale price of £203,528 on the DCLG valuations measure (implies 40%! 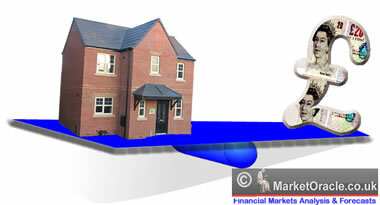 over valuation on other house price indices such as the Halifax). 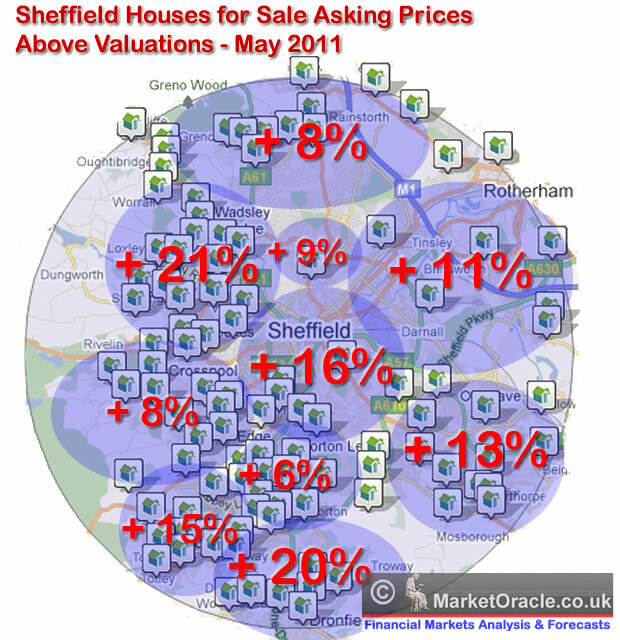 The national findings are inline with my own earlier analysis for the city of Sheffield which concluded in an average over valuation of asking prices by 13% (UK Property Sellers Inflated Asking Prices Risks Chasing After House Prices Downward Spiral). However as the below graph illustrates the city-wide average masks wide variations between areas that range between properties typically being 6% to 21% over valued, where the level of affluence or poverty is not necessarily a determining factor for the differences between areas of a city. Population Growth and Decline- Some areas of the city are witnessing falling or stagnant populations, which usually effects the mid range properties of an area rather than those at the higher or lower end, such as the East and the South of the City, which results in those seeking to sell properties over inflating asking prices as they compare general price trends across the city against their own properties expectations. The effect can be as serious as making the difference between 50% price increase over 10 years and zero increase or even a price fall. Local Schools Changing Performance - House prices can be effected in both directions if the local schools improve or decline in performance over time, which may fail to register with home sellers as their children may have grown up many years ago. New Houses - New housing stock usually from the low to middle price range areas of the city are unlikely to appreciate much during the first 10 years. Which can result in over valuations by sellers as they price their houses in terms of how average properties in their area's have appreciated. Cluster of Valuations - Over valuations and realistic valuations tend to cluster by area's because home sellers tend to look at what price others in an area are also selling for and therefore price according to the competition. Competing Estate Agents - There may be greater competition in overvalued areas between estate agents for business therefore a tendency to give properties higher valuations so as to secure business and shut out other agents, then a few months down the road when properties have failed to sell ask clients to cut asking prices. Crime Rates - Even a few bad crime stories of shootings and killings can have a significant and lasting effect on buyer demand for an area as well as the longer-term trends for crimes such as burglaries. Social Housing - Areas with more social housing will tend to see less appreciation in house prices, which may not be reflected in asking prices. No or Negative Equity - Home owners trapped into no or negative equity properties will find it difficult to price their properties at a level that the market will bear. Those most likely to be in negative equity will have many of the contributing factors as listed above and be unwilling to accept less than their outstanding debt. National Events Skewing Seller Expectations - One off national events can impact on Seller expectations such as is with the case of the Olympics in London, which has resulted in an estimated 10% inflation in asking prices even allowing for rising selling prices. The question mark is will London Sellers still be pricing in an Olympics premium after the Olympics? Meanwhile they can enjoy the boost for another year. Public Sector Recession - Just as the Olympics are boosting London, so is the public sector recession as a consequence of 500,000 planned job losses to depress areas where public sector works tend to reside and that impacts harder on Northern UK cities such as Sheffield, Liverpool, Newcastle than Southern cities. Therefore Sellers in cities such as Sheffield may not be taking into account the consequents of a contracting public sector which will hit those areas of the city that rely more heavily on the public sector for employment i.e. the middle income bracket areas, hence expectations for sharply higher supply could result in a very wide margin of difference between seller expectations and what the market is prepared to pay. Artificially Low Interest Rates - The current rate of inflation is 5% whilst the base interest rate is 0.5%. This results in low seller financing costs for mortgages and therefore reluctance for Sellers to market their properties in line with market demand. However sellers are playing a dangerous game as once interest rates do start to rise then they will see sharply higher debt financing costs, especially as market interest rates will move ahead of the base interest rate as well as coupled with less buyer interest as they are also similarly squeezed in terms of what they will be able to afford. Expand your analysis of house prices city wide so that you can appreciate if areas are over or more fairly valued as there is a tendency for over valuations to cluster in areas as sellers tend to price according to what other sellers in an area are expecting to achieve. Where future house price appreciation is concerned the most important consideration is location, however that does not mean that all of today's positive reasons will still be in place in the future when you also decide to sell and move on, so you need to appreciate the direction an area is trending as a result in changing populations. But the higher relative priced areas offers a better chance of maintaining an area's relative status and future price trend over time. So if you want to maximise future house price growth then buy a smaller house in a more expensive area rather than a larger house in a cheaper area. The bottom line is that given the level of unrealistic seller fantasy land asking prices, buyers should not be afraid of making deeply discounted offers, typically starting at 10% and perhaps as high as 20% depending on area specifics. The UK housing market depression continues as Labours election bounce has long since evaporated, many home owners relieved that the house price crash had stopped during early 2009 had put their plans to sell on the back burner as they envisaged a return to the 'norm' of rising house prices, this expectation continued even after the coalition government took office and announced unprecedented spending cuts and tax rises during mid 2010, that started on schedule in April 2011. The Inflation Mega-Trend (E-Book FREE Download) continues to eat into household incomes as official inflation is running at between 4.2% to 5.2% whilst average wage increases are running at 2% or less per annum. On top of this we have the still mostly bankrupt banks reluctant to lend as they prepare to line up for more tax payer cash (capital injections) as a consequence of the inevitable sovereign debt defaults starting with Greece which I covered at length recently in (Bankrupt Greece Blackmails Europe, Bailout or Euro Zone Dies, Global Financial System Collapse). 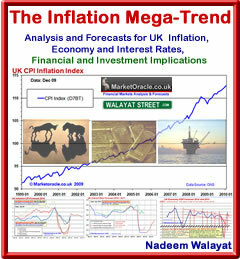 My next in-depth analysis will look at the expected impact of the Inflation Mega-trend on UK house prices. your price chart, does that include mid range properties in London suburbs? OR will they likely stay flat plus or minus 5% say, overthe next yr or 2. London has always been a special case because Britain cannot export goods so it imports foriegners to sell services to, most of whom choose to reside in London, which displaces the indiginous population into the suburbs.